My craze for shopping online leads me to buy a whole lot of cookbooks. Sometime,I love to browse through the pages, imagining how the recipes would taste and how welcome it would be on the table. Sometime, I think of making changes or using the basic idea of a recipe and converting it into something my folks would appreciate. 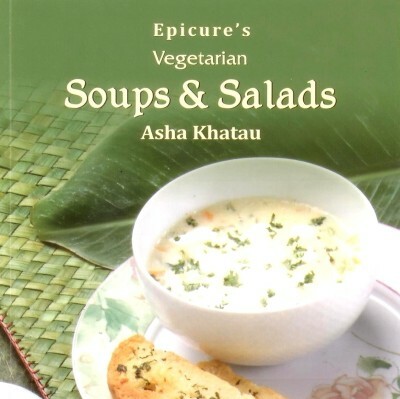 So, as I was telling you, I got a whole load of cookbooks and one of them is Asha Khatau’s Epicure’s Vegetarian Soups and Salads. Recipes like Chunky pizza soup,pop corn soup Calorie burning cabbage soup do sound very intriguing. And in the chilled soup section chilled cheery soup is something I would love to try. Salads like Seven layered salad,Gazpacho mould,Curried cheese mousse sound exotic. All the recipes makes use of easily available stuffs and with clear instructions. The only drawback I feel is the lack of pictures.There are just 8 pics for so many recipes! I wish there were more so that we can get to see how the finished dish looks. This is the 4th book I am reviewing for the Foodies Read -2014 Reading Challenge that I had signed up earlier this year.I have signed up for the Sous Chef level, meaning I have to read 5-9 books and review it by the end of this year.